6.2 has officially dropped, unlocking Tanaan Jungle, shipyards, mythic dungeons, a raid, and much more for the players to explore. Especially since the patch came after a long drought of content, the Fury of Hellfire has been the talk of the community. So what have Fussypants and Yotaan been doing? Fussypants: I have been eagerly awaiting this patch! The new content is great fun to do together with my guild and I really enjoy the ‘Timeless Isle’ nature of Tanaan Jungle. My one complaint is, like most content, it is not really geared towards healers. So consequently, all of my exploration of Tanaan has been with others. Because of this, I am probably not as far along as others with the rep grinding and whatnot. This is of little important though; I am really enjoying exploring the zone. And finding all the hidden treasures has been one of the coolest thing. On the shipyards front, I am less impressed. I wasn’t all that excited about shipyards in the first place and I’m just luke-warm about it now that I have one. My problem is two-fold. First, it seems so hard to get off the ground and start actually getting useful things from the shipyard. The rewards for the naval missions are rather boring and I often can’t get over 80% on the mission success rate. In addition, everything is so spread out! It’s a trek down to the docks, and then another trek between the ship making guy and the ship sending guy. I know this might sound like lazy complaining, but the time really does add up. All together, the shipyard hasn’t really been worth my interest, so I haven’t really done anything with it. Yotaan: Well, my interest in WoW has been very low lately. I stopped playing for several weeks. Yotaan languished in his garrison, looking for something to do. He heard that Fussypants was busy, but he just didn’t care. Then, news of 6.2 came along. Hmmm, somewhat interesting, but nothing compelling, really. But one significant change gave Yotaan a goal, finally something to work towards. Flying. While I have not been a proponent of flying in the game, it was intriguing enough to go after. And Yotaan ventured out the garrison, doing Apexis dailies and gathering treasures. He even raided with Fussypants once! Now 6.2 has dropped, and there is stuff to do! Honestly, I haven’t gotten very far, but it has been interesting. The on-rails feeling was there to get to Tanaan, but it was an enjoyable set of quests. I am not so sure about the shipyard, and why did have to rescue the rebel orc shipwright? The night elf dude is making my ships! My other quibble is that the story is disjointed if you don’t raid. All of a sudden Gul’dan is in charge, and I don’t know why. Anyhow, it has been great to finally do some new things and see new sights. Yotaan will be working on those reputations to get flying for him and Fussypants. Of course, he will explore all he can and get that flying mount! Fussypants: Oh yeah, I forgot about that, thanks for reminding me Yotaan! I also thought that the ‘And Gul’dan said Let there be Fel, and there was Fel, and Gul’dan saw the Fel was Good’ switch was rather abrupt. We go from fighting the Iron Horde all expansion to suddenly hello! Burning Legion! Also why did the Alliance have to go get that orc guy anyways? 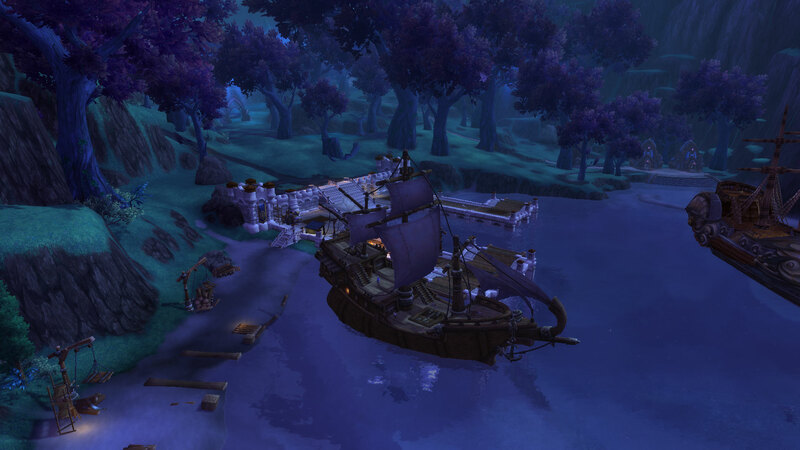 We have countless engineering feats (Stormwind Harbor, Deeprun Tram, Skyfire, to name a few) so why couldn’t we build a simple dock and some ships? We recruit the orc and then he just disappears? I think that might have been Blizzard’s way of showing the collapse of the Iron Horde, but they could have come up with a better reason for the Alliance to recruit the orcish shipwright. So what did you guys think of 6.2? Note: Fussypants and Yotaan are going on vacation for a bit, so there will not be a blog post next week. Us writers need a summer too! Garrisons are inarguably a very central part to the WoD expansion. But, as it has been mentioned a few times, they will not be coming with us to the next expansion. At least, not in their current incarnation. But it does seem likely that Blizzard will take some of the technology and ideas from the garrison and use them in the next expansion. So, what would I want to see? It’s hard to say exactly what I would want because we don’t yet know what the expansion will be. 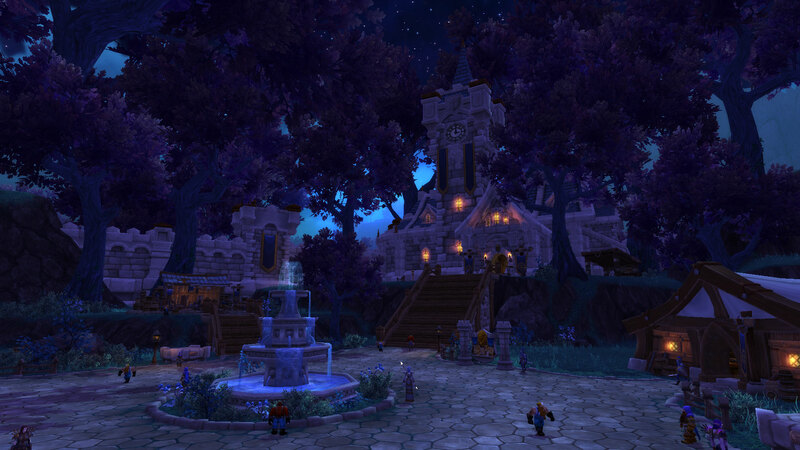 The garrison of WoD was intrinsically linked to the story and feel of WoD as was the farm to Mists. So whatever the next expansion would be, the next incarnation of the garrison would have to fit in with it thematically. However, without knowing what the next expansion will be, there are still some things I would want to see with the next garrison. One of the my main issues with the current garrison is that it is so large. There is a lot of space to cover, which makes running around doing chores can be a very tedious thing. This space made sense since the garrison was a military outpost, but in the next incarnation, I would like to see something a little different. Something a little more compact. If at all possible, I would like to see Garrison 2.0 as one building, sort of like a compound. 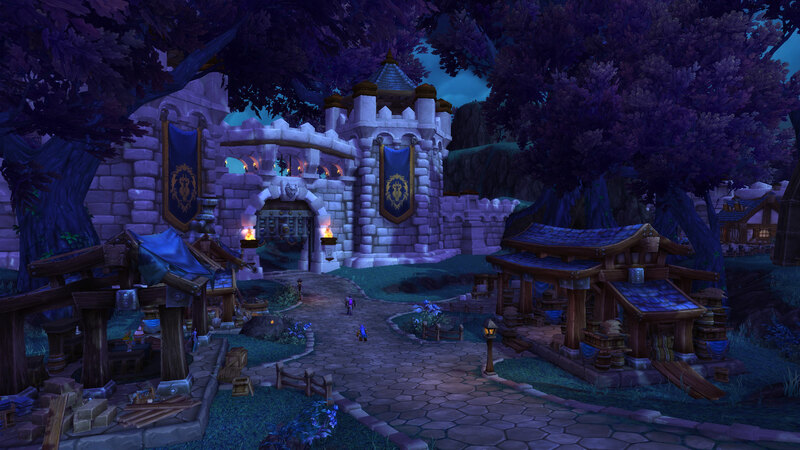 Specialization of your garrison would come from the rooms you picked rather than separate buildings. Keep in mind, I do not want to see the next garrison become a house. But I think it should be smaller than it is, and making it a compound would be a good way of keeping it smaller. I would also like to see race themed buildings in Garrison 2.0. Especially if it is one building, it would be much easier to design for all the race (smaller space, reusing models). My gnome is sick and tired of barely being tall enough to see things in her garrison and my draenei would really prefer a few more floating crystals. The changes wouldn’t need to be huge, just enough to give each race a little ‘flair’. The other problem with the garrison was that once you had it all set up, there was very little reason to leave it. People would log into their garrisons, do their garrison chores, check their bank and AH, and queue up for their instances. I know Blizzard doesn’t want people to hang out in the capital cities all the time, but hiding in our garrisons was even worse. So the next incarnation of the garrison will need to include much more incentive to venture out. In order to do so, Garrison 2.0 should have more quests to find things outside the garrison with enticing rewards. Think the Inn, but with quests to find things out in the world as well. There should also be randomly spawning things out in the world that you can find that would help your garrison. So while you wait for that instance queue, you are out in the world searching for something, or trying to complete a quest. The Alliance Garrison is so picturesque! Finally, professions should not be a part of the new garrison. Sure, the garrison might award some mats or recipes for them, but nothing on the level of the Herb Garden or Mines. And definitely no crafting huts like we have today. People should have to again go out into the world to gather their mats and craft their stuff. One thing I thought was very well done, was the set and forget missions. I would like to see something similar (but not the same!) in Garrison 2.0. While I’m not entirely sure what the next version should be, I do like the mini-game of missions. I would advocate for less missions but the ones we keep give more interesting rewards, but missions are in a pretty good state where they are. Here’s an idea actually, for missions 2.0. Players can set out missions for other players to complete instead of their followers. Both those setting out the missions and those completing them get some sort of specific reward that helps them to further their garrison. For example, setting out missions gets you a garrison specific currency while completing missions nets you in gold. And then that garrison specific currency can buy things like gear, toys, pets, and more. That could be a fun way to get people out into the world again. I think garrisons have been an overall very successful part of WoW. However, like all things they have had their faults. Moving forwards, I really hope that the next garrison encourages more ventures into the world as well as interaction between players. The next garrison should be less of a home base, and more of a starting point for your playtime. Tin Foil Hat: What is the Light? Warning: What you are about to read is pure speculation, a Tin Foil Hat article if you will, about the nature of Light and Magic in World of Warcraft. Please do not take this as 100% true fact until you hear Blizzard themselves confirm or deny it. Last night my guildies and I had a very interesting and speculative conversation about the Light in World of Warcraft. It all started off with a discussion of Sylvanas (as all good conversations do). As the lore goes, Sylvanas was first killed by Arthas during the Third War and then resurrected as a banshee. Her first experience with the afterlife was peaceful, comforting, and warm. When Arthas was killed at the end of the Wrath of the Lich King expansion, Sylvanas jumped off of Icecrown Citadel to her death. However, this second experience with the after life was starkly different. It was dark, painful, and terrifying. These two versions of the afterlife (Azerothian Heaven and Hell) seem to be connected with the Light since Sylvanas was a High Elf originally (and the High Elves were believers in the Light). So it is safe to say that the second time Sylvanas died, the Light had abandoned her. But this begs the question, why? Was it because Sylvanas did evil things in her second life? Or was it purely because she had been raised by necromancy and the Light had deserted her right after that regardless of her own morality? Pulling evidence from other Light users in the game lore, neither option seems to be the answer. The Scarlet Crusade is many things, but morally right is not one of them. They commit acts of murder, torture, and worse. However, the Light has not abandoned them. In fact, the Light is one of their principle tools for wrong-doing. Or another instance, the Blood Elves. Their Light practicing started out with them literally sucking the Light out of a Naaru like vampires. They stole and slowly killed Muru but were still able to wield that Light energy. So is the Light simply a tool? Is there no morality, no good and evil attached to it? Wielded by the Scarlet Crusade, the Light seems more akin to the Force of the Star Wars franchise. But then that means Sylvanas was abandoned to the light because she was resurrected by corrupting necromancy. This would make more sense when compared to other instances of Light abandonment. Take for example, Nobundo. Nobundo was a paladin fighting against the orcs in the original timeline. However, exposure to Fel magics caused the light to abandon him and he turned to shamanism. So there is yet another example of the Light abandoning because of corrupting forces. But there is still a wrinkle here that hasn’t been explained. What qualifies as a corrupting force? How much exposure must a Light user have to corruption before the Light leaves them? And why is the Light so different between races? The Blood Elves bear the fel taint in their very eyes, but they can still use the Light. However, the Broken have been exposed to fel and their connection is cut off. Night elven priests wield the Light of Elune (the Moon) whereas Tauren priests pull from An’she (the Sun). And what about Pandaren priests?? The more you look at it, the more inconsistent the Light seems to become. So many different races use so many different Lights and all of them have slightly different rules. Is it possible… is it possible that there are different Lights? What if there was a spectrum of ‘Light’ and every race pulled from a different part of that spectrum? That way all Light users are using the Light, but each Light they channel is slightly different. Because of the cultures of the races, they are more attuned to pulling a different ‘flavor’ of Light. What if all magic was that way? 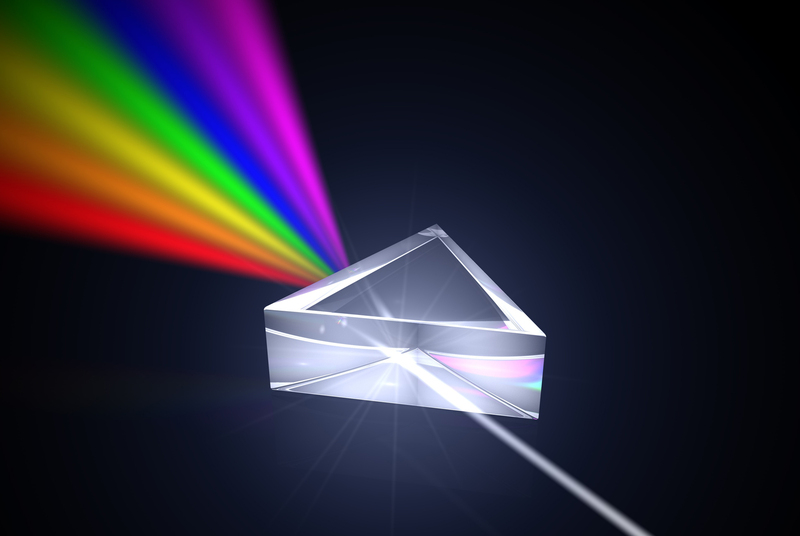 All part of a spectrum of Magic with Light being just one ‘color’? 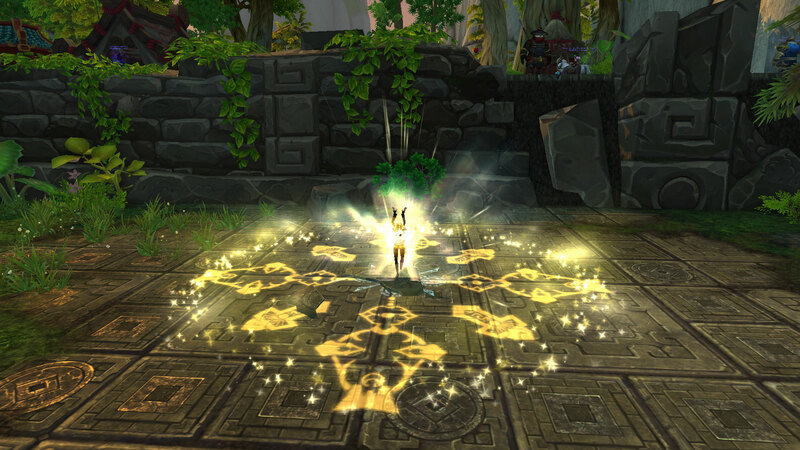 Imagine that magic in Warcraft is white light reflecting through a prism. So we have warlock, priest, shaman, druid, death knight, and mage magic are all different colors on the spectrum but essentially all part of the same rainbow. The rainbow of magic (oh how corny). But if that’s the case, then what is the white light? What type of magic can be broken down into all of these varied forms. I would argue that it is Arcane. When you think about it, every type of magic except arcane is modeled off of a natural phenomenon or element. Fire, Water, Shadow, they are all mimicry of a real thing in the world. But Arcane is the only one that is not. Arcane is not corrupting, nor does it copy an element in the world. Arcane seems to be the pure form of magic. However, once you add the ‘prism’, Arcane magic can be broken down into many different colors of magic. So, within arcane magic, you can find the magics of every other class in game. This can also help to explain why different races seem to use slightly different variations of the name magics. That is because they are pulling from different ‘shades’ of one color of magic. Going back to light magic, Draenei, trolls, and Pandaren are all pulling from the part of the rainbow of magic that contains Light magic, but they pull from different colors of that spectrum. So for example, if Light were yellow, the Trolls might pull more of a green yellow color while Draenei pull more of a orange yellow and Pandaren pull the true yellow. This can also explain why certain magic users seem to overlap in their magic types. Mages, Shaman, and Druids might pull from ranges of the spectrum that overlap, but they do not pull the exact same colors. A races’ society and natural adeptness influences what types of magic they can pull from the spectrum of magic. And this spectrum is what creates the varied forms of magic throughout the World of Warcraft. I love mixing and matching different ‘official’ gear sets. And apparently, this is a cardinal sin of transmog but I especially love mixing sets from different expansions. Sometimes, one can really tell the age difference of those pixels. But every so often, I get it right. And what I create is a great fusion of two different eras of WoW. Today’s sets aren’t entirely fusion sets but a good number are! I am featuring a lot of plate and cloth after the leather heavy last article. Without further ado, here they are! I always loved the cloth BoA set that the garrison Bunker/Mill sold. However, I was not as big a fan of the rather revealing nature of the robes from that set. And on the other hand, I’ve always loved this chest model from BC. So I took pieces from both and fused them together! I think this one turned out really nicely! Since both are from ‘Draenor’ of sorts, it keeps with the extraterrestrial and rugged theme. The pieces of set should be very easy and inexpensive to obtain, which is another bonus! The chest piece can come in either robe or shirt model, which lets you choose if you want to wear a skirt or pants. This set unfortunately is restricted to paladins only, which is a shame because it’s such a great plate set. I mixed WoD PvP gear with a personal favorite of mine- the Overlord plate set. The result was a more rugged (might I say… savage?) paladin set that works great for displaying tabards. I picked the Shado Pan tabard because the colors contrasted nicely, but any tabard would work well. I almost didn’t want to share this next set; I liked it that much. 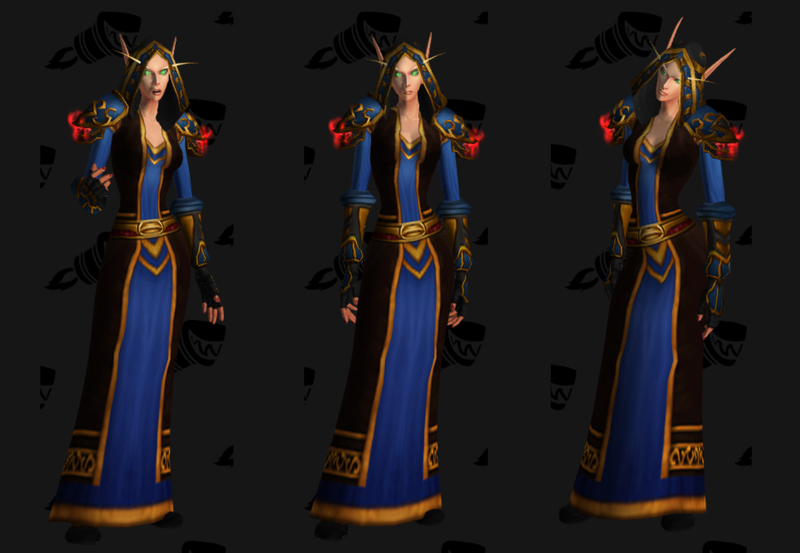 But since I love you guys that much, I will show you the Best Transmog for Draenei Mages Evah™. The set is a mix of BC tiers with a WoD staff added in. I absolutely love the colors and mageyness and I think the set actually looks good on any race! (But best on draenei). And excepting the head, the rest of the set is not class restricted! This was another one of those ‘I want to keep this all to myself’ sort of sets, but I decided to post it all the same. I’m sure versions of this have been done before, but I really, really like this one that I made. It’s everything that a paladin should be: radiant, glorious, and shiny. And you guessed it; it’s also paladin restricted. Lots of paladin, mage, and PvP gear this time round! I think my next challenge will be to create some good mail sets since that is the one type of gear I haven’t hit yet. What do you think of these? Any suggestions or improvements you would recommend?